Do Page Load Times Affect Your Search Rankings? First of all, Matt Cutts, head of the webspam team at Google, stated in a recent Q/A video that sites’ load times are currently not a ranking factor. Matt’s opinion is that it would be a great idea for a ranking factor! And, he leaves open the possibility that it could be used as a ranking factor in the future. He’s influential within Google and is named on some Google ranking patents, so this is significant. Other significant Googlers also have indicated that this may be a focus area of increasing importance to them. Larry Page apparently stated that he wanted Google to be central to efforts to make the internet speedier, allowing users to get pages as fast as turning pages in hardcopy books. Last year, Google introduced Page Load Time as a ranking element in Google AdWords ads. Internal research at Google has shown that slower page delivery times will reduce the number of searches users will conduct by 0.2% to 0.6%. While this may appear negligible, it undoubtedly would add up to a lot of lost revenue over time for Google, and it proves their point that slowness has a chilling effect on internet use and traffic. Based on the above reasons I outlined, I think page load times are very likely to become integrated into Google’s ranking “secret sauce” soon, and that sites which seriously neglect page load time will find themselves at a disadvantage. Classic Search Engine Optimization (“SEO”) lists of tricks rarely include mention of improving page speeds, but Google has steadily been evolving their ranking methods to reduce the impact of technical code tricks and moving toward more human-centered design factors. In fact, one part of their process already includes having their quality team assess the webpages found in search results for many thousands of sample queries. If one of your site’s sample pages fall into their sample set, the assessor’s rating of the page compared to competitors could result in an average quality score being applied to all the pages on your site. I’ve believed for some time already that Google applies some automated quality scoring to natural search rankings, similar to how they’ve applied such factors to their paid search ads. My suspicion is that there will likely be some sort of scale of site loading speeds which might be used to impact rankings in the future. And, I’d also suspect that this factor would be used primarily as a negative ranking factor, as opposed to a positive one. By this I mean that pages from competing sites which have all other stronger relevancy ranking elements essentially equal could drop lower in search results if their load times don’t meet some minimum standard. Load time might negatively impact a ranking, but likely wouldn’t necessarily help it rise above a page which has slightly stronger relevancy/importance factors unless that page had serious slowness itself. I’d further expect that Google would apply some sort of adjustment to try to assess whether one Googlebot visit ran across just a momentary lag condition, versus a page delivery speed that’s always slow. So, I don’t see any reason to freak out if you have experienced a server or application issue for just a brief period! Even if Site Load Time were not to become an official member of Google’s list of over 200 ranking factors, load time could still indirectly affect your rankings. Avanish Kaushik at Google has strongly encouraged webmasters to pay attention to Bounce Rate (a factor determined as a percentage of site visitors that only visit one page and/or who only land on a page for a few seconds before hitting the back button). Google can also easily see if a user immediately backs out of a page they find in the search results, and such a high bounce rate may indicate a poor quality result for a particular query. One prime cause of a user hitting the back key can be if a page is extremly slow at loading. So, if Bounce Rate is a factor affecting rankings, then a page’s load time may impact it, indirectly affecting rankings. Finally, let’s go to Google’s original point about why this is important in the first place: good User-Experience. Along with faster network speeds, sites need to load rapidly for endusers in order to provide a positive user-experience. Even if this were never used directly or indirectly by Google in rankings, it will still affect how users experience your site, and that can affect your ultimate conversion rates and repeat visits. 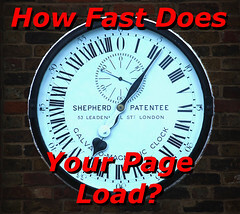 But, Page Load Time / Site Load Time will almost certainly be a direct or indirect ranking factor. So, how to prepare for this important and basic factor amongst all your site’s various optimization strategies? Well, very easily and cheaply, you could get a copy of Google’s Page Speed extension and run it against samples of your site pages to see what speed factors it might recommend for you to improve upon. Also, note that this browser-based diagnostic tool does not assess a number of factors which can still affect site load times, such as network connection times and conditions which cause sites to buckle under higher loads. KeyRelevance has long considered site load times to be of prime importance and has included a number of factors affecting page load speeds in web site reviews that we provide for clients. In fact, we even provide clients with improved compression versions of their site images for smaller filesizes. Speed of access has long been important to a site’s overall user-experience, and Google’s increasing focus in this area is now making it of central importance to keyword rankings in search results. So, if you want to be at the top of your SEO game, you need to be paying attention to your site’s page delivery speed — Google is! This entry was posted in SEO, Usability and tagged Google Ranking Factors, Page Load Speed, Page Speed, search engine optimization, SEO, Site Speed, Usability, user experience by Chris Silver Smith. Bookmark the permalink. chris, despite what Google says it has been my experience that when page load time increases, organic traffic goes down. In particular the # of pages crawled goes down so a page that does not crawled either may not get indexed or if it is already in the index it might start to age and get less competitive. Regardless of the SEO implications, in my experience a slow page load typically goes hand in hand with a sub par user experience. So you may be able to get the traffic but it won’t stick around. That’s a good point, Andrew! I neglected to mention that in the video, Matt states that page load times are not currently used for scoring pages for rankings, but he *did* state that if the page is too slowly returned it could timeout, causing Googlebot to be unable to index the page — which would affect a site’s presence in the search index! And I agree with your experience — sluggish sites = reduced traffic. Css, Images, from what I have seen are some of the minor issues in load time these days. I’m seeing coding effect load time more than anything. Large java libraries, wordpress type plugins are especially bad when the site owner installs many of them which can cause sites to drag. It is in adwords where loading time is one of the algo to improve quality score. Code cleaning, PNG image, CSS, play important role for loading optimization. I’ve also noticed when load times are longer crawl rates drop significantly. I also seen drops in conversion rates for my PPC campaigns when load times increase by a couple of seconds. My best practice is all web pages should load in under 10 seconds, preferably 5 seconds.